As you enter in the front door, the enticing aroma of homemade cherry and apple pies baking in the oven is prevalent throughout the store. At the same time, your sense of smell is also awakened by the fresh made donuts and fudge being carefully created. A quick glance around reveals the nearly two hundred year old reclaimed Wisconsin barn wood, posts and beams used throughout the store. You wonder about the stories they could tell of a past bygone era! Now, however, they are content to hold up the ship lap boards on the old ceiling, replicating the job they were so used to performing over one hundred years ago. Continuing to walk around the store, your eyes are drawn to the many artisan goods on display including the wide array of specialty jams, salsas, pickles and baking mixes. Your fingers feel the soft, luxurious alpaca blankets and Home T-shirts. You also try a bit of the shea cream that moisturizes your hands and makes them soft to the touch. Open through Dec. 31. Closed Jan-Apr. 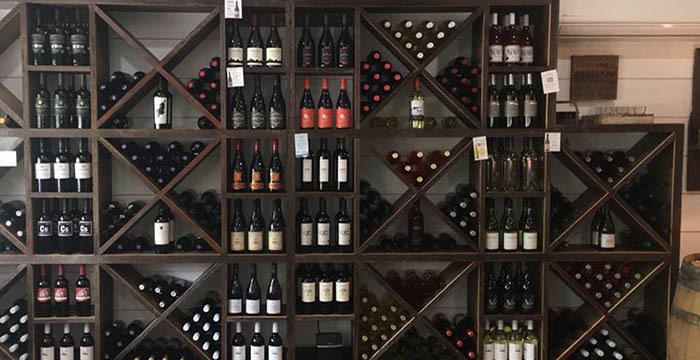 Finally you make your way to the stores wine tasting area where you try the latest selections along with delicious food pairings that are a treat for your taste buds. You smile as you think, "Oh what a feast for the senses!" Since 1950, Rays Cherry Hut has been a roadside farm market destination in the beautiful peninsula of Door County, Wisconsin. 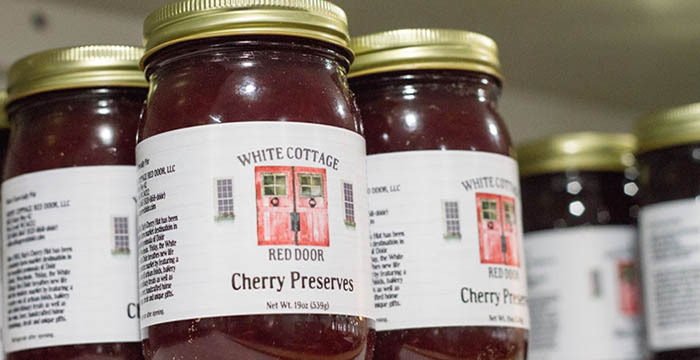 Today, siblings Lisa Howard and Chris Hadraba along with their spouses Kevin and Jessica, have opened a new market called the White Cottage Red Door. 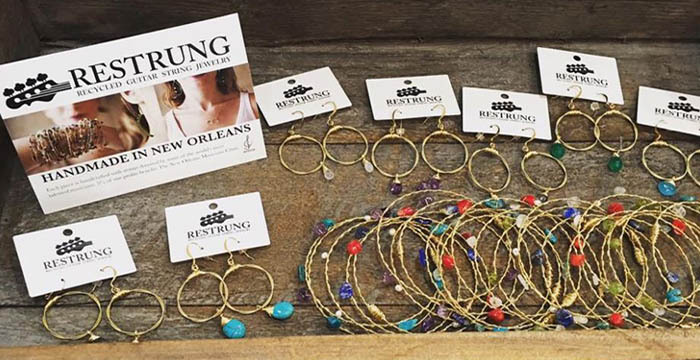 By featuring a creative mix of artisan foods, bakery and confectionery treats, as well as fine wine and beer, handcrafted home furnishings, decor and unique gifts, the new store has breathed new life into Rays historic market. The two families purchased the old building at the beginning of the year and for the last three months they have been busy remodeling the inside and outside. 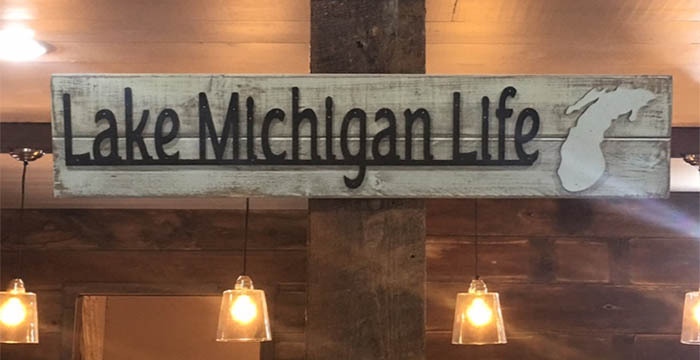 Their inspiration was to remake the building into an old farmers cottage with reclaimed barn wood, with posts and beams and painted pine ship lap on the walls and ceiling. Why the name White Cottage Red Door? According to Lisa, "What is more quintessential to Door County then a white cottage set on the beautiful shores of Lake Michigan. And in traditional America, if someone saw a red front door it was a sign of a home that was a safe stop to stay the night and have a meal. We would like to convey that same homey feeling to our customers that will walk through our door." 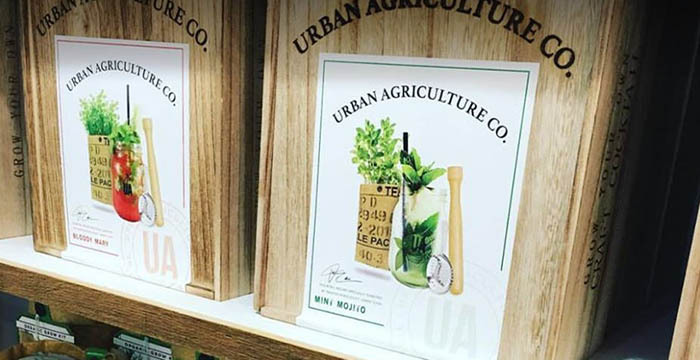 The stores tag line is "Artisan Goods for Home and Table" and the store will feature many American products created by skilled artisans. For example, these products include canned farm food items such as jams, jellies, salsas, and salad dressings . Picture frames, pillows, soaps, glassware, and lamps are only a few of the many offerings the store will have. The bakery will feature delicious "hand-made" fudge which is quite different than homemade fudge. We make fudge the old fashioned way in a copper kettle, poured out and carefully manipulated on a 4" marble slab. In addition, hot and fresh donuts will be made throughout the day along with the baking of Cherry, Apple, and other fruit pies available in both 6" (perfect for 2 people) and 9" sizes. Another element of White Cottage Red Door will be the rustic yet elegant wine & beer tasting area. 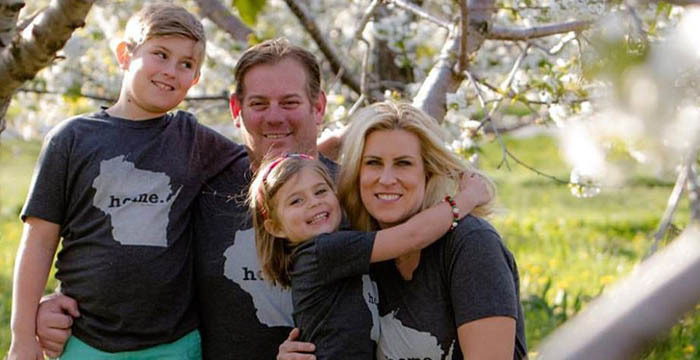 Jessica will select fine wines and craft beers from throughout the U.S.,with a concentration of Wisconsin craft beers and wines from different regions, to feature for each days tastings. She will also prepare a variety of specialty food pairings to go with each sample that may include fresh baked rosemary boule bread with olive oil and freshly shaved parmesan cheese, fudge & confections from the bakery, Wisconsin made tortilla chips and cherry salsa, maybe even some fresh cheese curds! A humidor with some fine cigars will also be available in the tasting area as well.